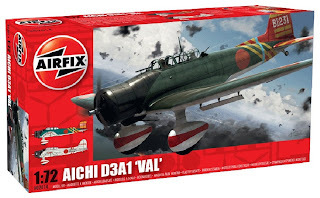 Aviation of Japan 日本の航空史: Airfix Aichi D3A1 Val Rides Again! Airfix will be re-releasing their venerable Aichi D3A1 as a special edition to coincide with the 70th Anniversary of the attack on Pearl Harbor. 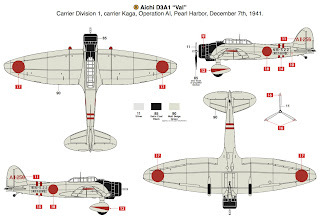 In addition to the well known 'BI-231' of Lt Cdr Takeshige Egusa offered in the last release of the kit decals are now included for presentation aircraft # 522 'AII-256' from the carrier Kaga at the time of the attack. Good choices both. The old 'AI-201' of the original kit appears to be no more, has ceased to be . 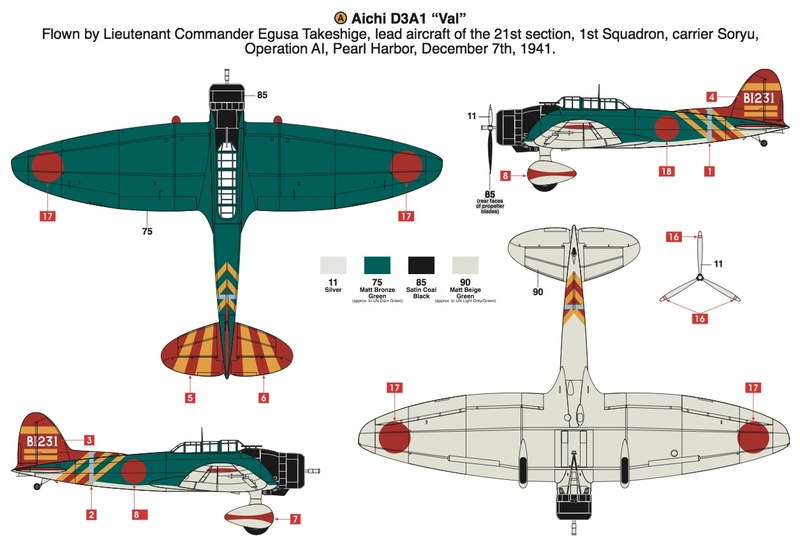 . .
Egusa's aircraft is captioned as for the Pearl Harbor attack but it is doubtful that the dark green camouflage paint was worn at that time and this scheme is more usually associated with the later Indian Ocean operation. 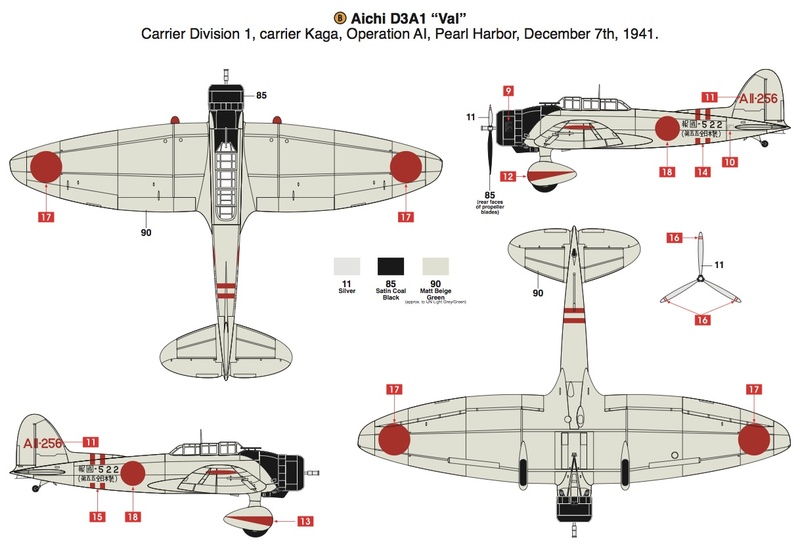 Captain Agar described the Japanese dive-bombers attacking HMS Dorsetshire on 5th April 1942 as "painted green with red wingtips". And Cdr (Ag) John Fair's report on the sinking of HMS Cornwall during the same action described the dive-bombers as "Camouflaged 'Deep Sea' with diagonal red band just before the tail" presumably meaning a deep sea green in colour. Painting suggestions are for Humbrol 90 Matt Beige Green to represent "IJN Light Grey Green" (sic) which is the same paint Airfix recommend to represent RAF Sky - not really representative of the olive grey colour. I continue to be amazed at the imparting of duff information - even by people who ought to know better - when researchers have been sharing their findings for more than a decade. For a more representative appearance using Humbrol paints consider adding a little Matt 225 Middle Stone to Gloss 40 Pale Grey which is already a "warm" grey of beautiful consistency and finish. This will achieve a good looking semi-matt finish. For the Dark Green Humbrol 75 Matt Bronze Green is recommended. This is not bad but lacks a little in green chroma. I'll be looking at IJN Green paints in more detail as part of the Raiden series and will tackle Humbrol mixes then. No concession is made to the blue-black of the cowling, which like RAF Night, was a mix of ultramarine and carbon black pigments rather than a pure black. This 1964 kit was mentioned fondly here and what modeller John Wong managed to achieve with it is shown here. As you pregess, Nick, well soon be badgering you for a separate file with colour mixes.